Hooray for an "off" football weekend! I had this vision of cleaning and getting stuff done around the house with all the time I would have. Well, that didn't happen, but we did have fun! It all started on Thursday night when Forrest and I decided to see a movie. My mom had given us a coupon for free movies and it expires on Halloween so we wanted to put it to good use. The problem was, we couldn't find a movie that would accept the pass and that we both wanted to see. Instead, we compromised and Forrest and his brother Davis went to see Jackass and I went to see Secretariat by myself. Yes, that does in fact make me a little lame but there were only 4 other people in the theater and I knew 2 of them so I didn't feel too uncomfortable. We both enjoyed our movies so the whole scheme worked for us! 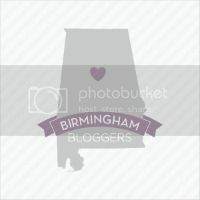 On Friday night Forrest had to be on call at the hospital in Birmingham for his oral surgery rotation. Since he wasn't going to be home, I went with my aunt and uncle to the Gadsden Titans game to see my cousin Sara dance with the danceline. The Titan band is quite large and they always do amazing field shows--this year was no exception! The show was "MoTown", complete with a Tina Turner and mini Michael Jackson! I had a great time even though it was freezing! When I got home my brother came over for a quick visit before I decided to call it a night. Luckily, Forrest got home about 1 so it wasn't too terribly late! My little Sara is all grown up! ﻿ I was SO excited to get up on Saturday because I was taking Ruffles to be in the Humane Society Howl-O-Weenie parade! I dressed her in her hot dog costume and added a hounds tooth bow, so she was a Gameday dog! I wore my hounds tooth coat so we matched. Denise and her dog Pacino the shark were also going to be in the parade so we rode together. It was so much fun to see all of the precious pups dressed in their Halloween outfits! Ruffles was nervous about all of the dogs at first but when they gave her a treat bag she was ready to show off! Forrest came as the parade started and brought Sonny to support his sister. He had a great time checking out all of the other dogs and even was given some tennis balls to play with. Neither Ruff nor Pacino won a prize, but they had so much fun and were happy to support the Humane Society! This mail man cracked me up! 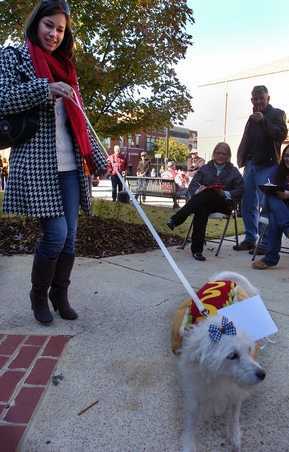 Ruffles had her picture taken and it was on the Gadsden Times website! She is a star! That afternoon Forrest and I took Sonny on a hike through the woods. WHEW I was out of shape! When we were done I was totally exhausted, but I was glad I went. The weather was perfect and the fall leaves made the trip so beautiful! Sonny of course had a great time, as he has endless energy! After the hike it was time for Mass. I LOVE being able to go to Mass on Saturdays because it means that I get to sleep late on Sundays! After church we went to my parents' house to watch the AU v. Ole Miss game with the fam, since my brother and sister were both in town. Davis and Justin and Farrah came as well, so we basically ended up having a little party! We had a great time watching several games and once and not having to be nervous for our own team!! On Sunday I got too sleep late---hooray!! Forrest, however, got up at the crack of dawn to go to the race in Talladega with Justin. It was his first time to go and he was SO excited! He literally has been counting down the days! He went in full "Dega" attire and I am a little sad that I don't have a pic of that. I know he had a great time! Thanks Justin! Since our guys were going to the race, Farrah and I decided to have a girls' day of our own! 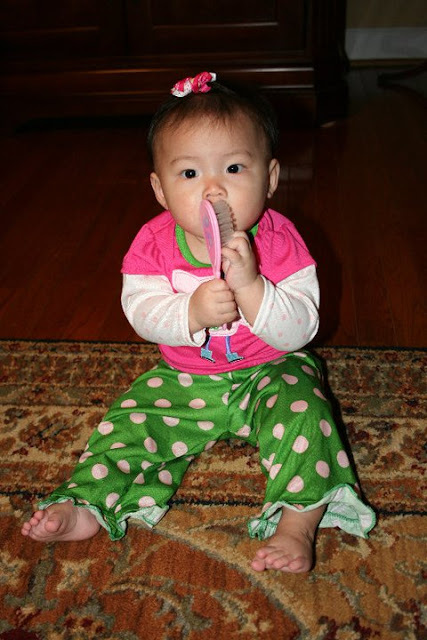 First, I met her at Justin's house to formally meet their new niece, Jameson, who was adopted from China. 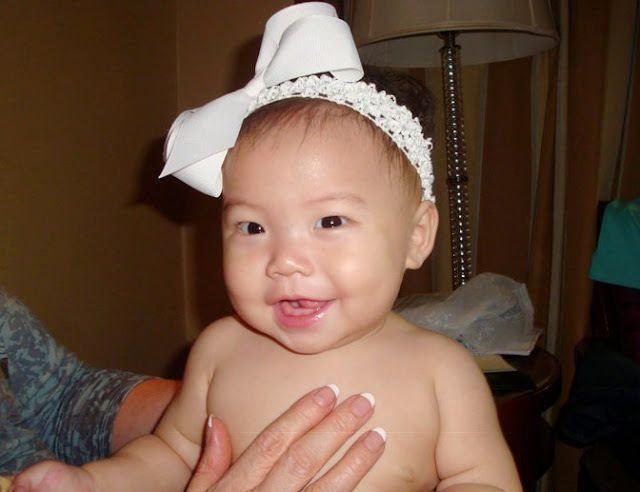 She is totally precious and the happiest little baby I know! I brought her a pair of pj's with a kitty cat in a scarf and ski boots on it (so cute) as well as some cute socks with ribbons! Baby girl stuff is so cute, I could have bought her hundreds of things!! Jameson in the pj's I gave her! After playing with Jameson we went to the movies (on my last BOGO coupon) to see Life as We Know It. It was totally girly and sappy, so it made for a perfect girls' day! One of my favorite things about seeing girly movies is that the previews are always for more girly movies! Farrah and I now have a list of new movies to tackle the next time! A grocery run and dinner at my parents' with my brother and sister rounded out a great weekend. Hope you all have a wonderful week! I just finished reading The Help. I actually looked for the Elephant book you are reading here in town after reading about your book club on the blog. However, Square Books did not have any in stock. Sad! You have GOT to read it, as it is totally awesome! It is also coming out as a movie in April w/ Reese Witherspoon and Robert Patinson.